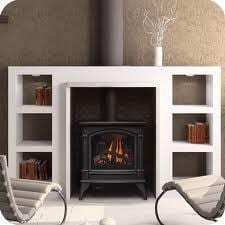 This unit is specifically designed to fit smaller wood burning zero clearance fireplaces. Available as a flushmount or create an optional bay front design. an optional arched cast iron surround with operable doors adds a dramatic look to this traditional insert. 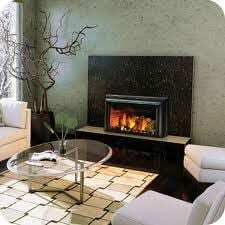 Accommodates the smallest fireplace openings but still provides an impressive 400 sq. in. viewing area. Designer options include trim kits in various finished in both three and four-sided aluminum surrounds. Decorative door kits in arched and webbed arched designs are also available. Medium size store may be compact in stature, but not in power. 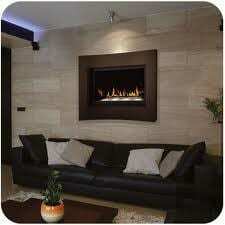 Perfect if you have limited space but still desire the beauty, warmth and conveniences of a gas stove. Offering a variable heat range up to 30,000 BTU’s to control the exact amount of heat needed. The precisely engineered burner system produces unique, patented YELLOW DANCING FLAMES which fills your room with a warm, inviting glow. 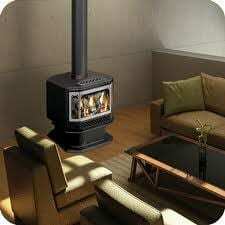 This is a large size stove with 86% efficiency. It offers a three burner system – the third tube burner “boosts” the heating power like no other stove in the industry. It operates independently to supply an additional 14,000 BTU’s on top of the already impressive 30,000 BUT’s. Create the right amount of heat you need. Safe, clean burning and high efficiencies make this stove a valuable addition to your home. Here is the perfect blend of a traditional design and advanced gas performance. The customized designer finishes available for this unit allow you to express your style and capture a look of elegance while at the same time, provides a comfortable range from 21,000 BTU’s to a hearth warming 35,000 BTU’s. Direct vent converts easily from top to rear vent. 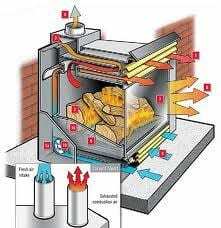 Direct vent technology draws outside air for combustion into the firebox chamber then exhausts through a separate vent. Both vents are installed into your existing chimney.